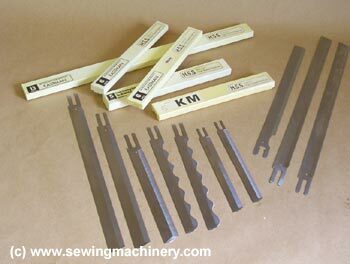 Straight knife blades available for most industrial straight knife cloth cutting machines. All popular blades available from stock. Special or hard to find blades can be made to order. Quality straight knife blades manufactured right here in the UK from Hi-Grade, high speed steel. Straight edge blades in sizes 4" to 14"
Wavy edge blades in sizes 4" to 14"
Coated blades in sizes 4" to 14"
Wolf : All model from 1970 onwards. When ordering please have the make, model & size of machine ready. Note: the blade size relates to the cutting edge and not its overall length.